Fig. 1. Part of the defensive wall of the ancient city of Kition was located in Teukros Street. 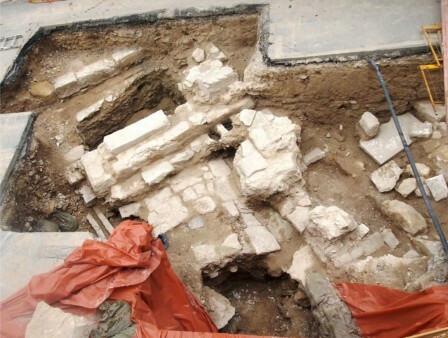 Excavation works are being conducted parallel to the constructions of the sewerage system at Larnaka, according to an announcement of the Ministry of Communications and Works, Department of Antiquities of Cyprus. The site of Larnaka has been continuously occupied from the time of its earliest establishment during the Early Bronze Age (end of the 3rd millennium BC) until today. Ever since the Early Bronze Age and up until today (for no less than four millennia) the area outlined by the Agioi Anargyroi quarter to the north, the Salt Lake to the south and from the westernmost limits of the city to the sea was uninterruptedly occupied. As such, archaeological strata of earlier settlements lie below the modern city. Within this area people from ancient times lived, left tangible traces of their presence and eventually were buried. 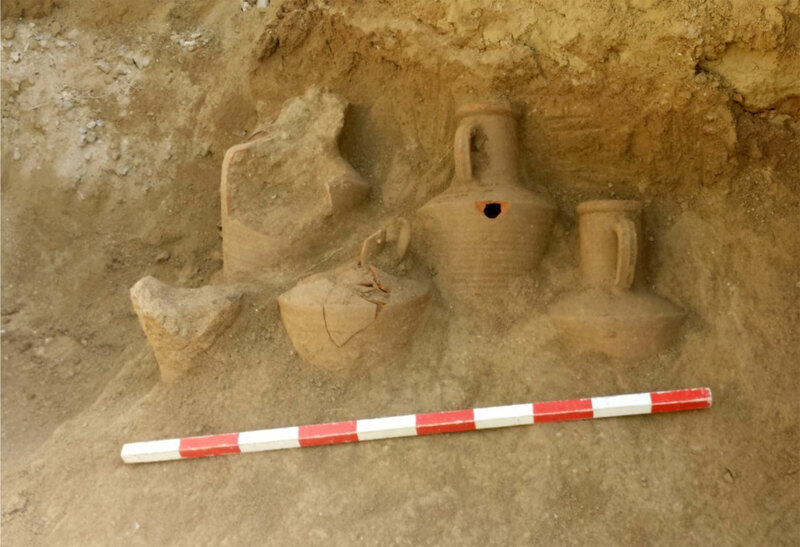 It thus comes as no surprise that, in the course of construction works conducted by the Larnaka Sewerage and Drainage Board, archaeological finds of considerable historic value are being exposed. 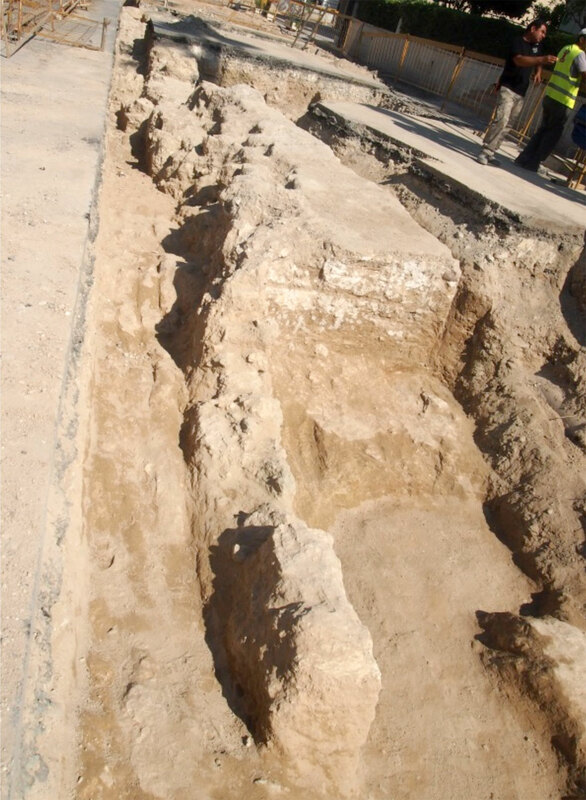 Among the most important finds is the part of the defensive wall of the ancient city of Kition that was located in Teukros Street (fig. 1). This is the first time, since the excavations conducted by Prof. Vassos Karageorghis, former Director of the Department of Antiquities, at the site of Kathari (the archaeological site of “Ancient Kition”) that such an extensive part of this large defensive work that surrounded the city is being exposed. To the east, namely within the walled settlement, substantial architectural remains are also being excavated. 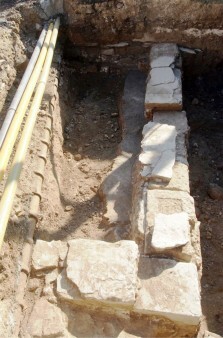 In Konstantinos Zachariades Street a series of eight parallel walls were uncovered, possibly dating from the Cypro-Classical period; a monumental structure of undefined use was excavated in Ephrosynis Tarsi Street, that dates perhaps to the Roman period (fig. 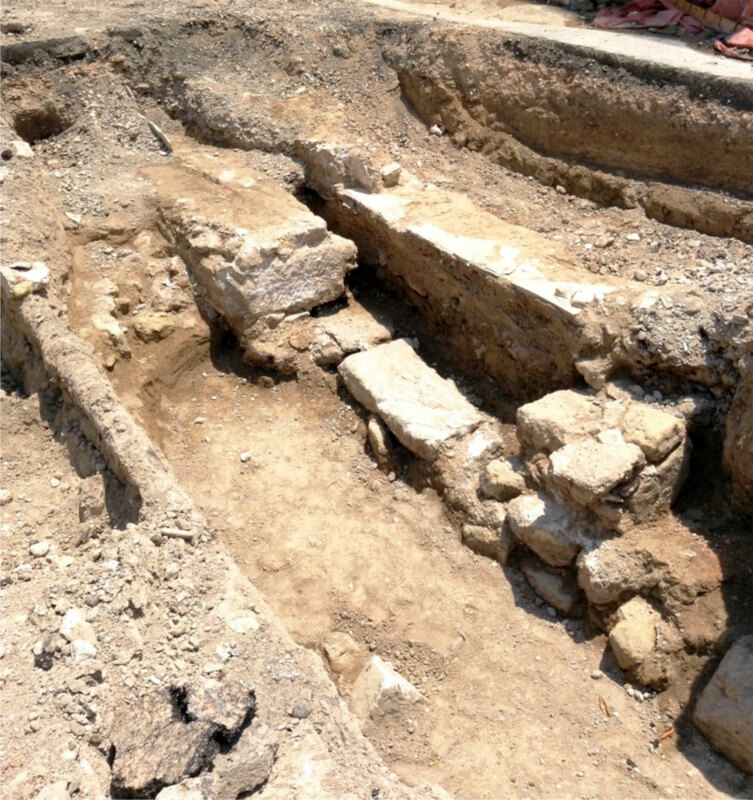 2), along with parts of what seems to have been elaborate houses also of the Roman era; part of a rectangular building with remains of a pebbled floor and terracotta water pipes were uncovered at Orpheos Street (close to the juncture with Kyriakos Matsis Street) (fig. 3) that may have formed part of an aqueduct; a sequence of ancient walls at Dimitrakis Dianellos Street (fig. 4). To the north, test trenches within Terra Santa Street confirmed that the ancient coastline was located further west in comparison to the modern coastline: a thick layer of pebbles along with the high water table demonstrated that the sea reached up to the northern rampart of the city of Kition during ancient times. In close cooperation with the Larnaka Sewerage and Drainage Board adjustments to the routing of the sewerage conduits were achieved in order to preserve any archaeological remains that could not be removed. The aim was to make them available for further research in the future. An extensive ancient cemetery lies to the east of the city-wall. 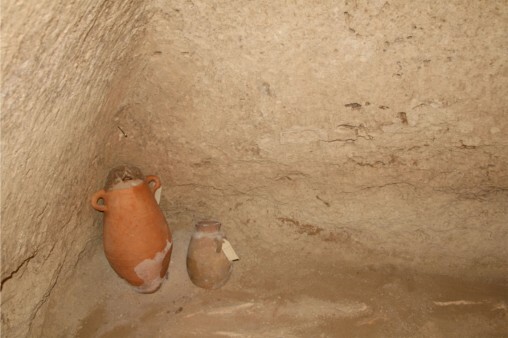 Up until today 28 earth-dug chamber tombs have been excavated that date from the Cypro-Classical to the Roman period (figs. 5-6). Among them, ten were found during 2012 in Grivas Digenis Street (Drosia) while the remainders were excavated from May 2014 onwards in Agesilaos, Aiolou, Gordios Desmos, Lipertis and Koultour Streets. Interestingly, most of these mortuary monuments (and especially the ten tombs that were located in Gordios Desmos Street) were not looted. Therefore, during the excavation process archaeologists managed to collect not only an array of grave goods (mostly ceramics and bronze jewellery), but also acquired valuable information regarding mortuary practices at ancient Kition. After the completion of the excavation (and the photographic shooting and drawing of the mortuary contexts), the sewerage construction works were continued unobstructed. The rescue excavations within the sewerage construction works has been a unique opportunity to explore an extensive area of the settlement area, where Larnaka lies as the latest local urban manifestation. The Department of Antiquities realizes that the construction of a sewerage system is a major work that will prove to be extremely beneficial for Larnaka. The staff of the Department makes all possible efforts within their power to carry out the parallel excavations efficiently and promptly. At the same time they gather precious information regarding the high antiquity of this area, aiming to rescue the historic assets of the island so that these survive for the generations to come.